Toki is one of those arcade games that wasn't particularly well known or even well regarded but which seemed to get ported to just about every computer and console known to man. Most of these were straight conversions of the original, attempting to replicate the arcade game to the extent that each respective platform's technology would allow. However, Sega's Mega Drive version was different. Instead of releasing a conversion, it looks like Sega released an interpretation of the arcade game. Quite possibly, the game's programmers had never played the original and based their version on some screenshots they'd seen in a magazine. Still, seeing as the arcade version had its faults, maybe a re-imagining of the game wouldn't be a bad idea. Toki: "Fancy a ride on my disco stick?" First though, the story. As I've never been one for reading manuals, I usually use the contents of the game to understand its plot. This is quite fortunate as I don't have a manual for this game anyway. So, according to the game, the story begins with Mr Toki standing in a field of flowers with his scantily-clad lady friend. He doesn't appear to be wearing much either, so one can only guess what the pair of them are up to out there. However, before Toki gets the chance to get his end away, the sky suddenly darkens, the music goes crazy, and a mysterious building appears in the background. Oh no! What's worse, a giant hand then grabs Toki's bird and whisks her away to the newly erected mysterious building. 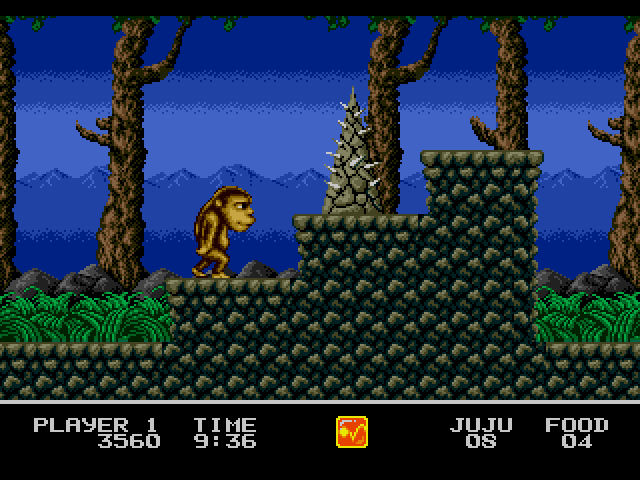 And to kick a man while he's down, a strange wizardy person appears, turns Mr Toki into an ape, and then vanishes. Toki, now in his simian-form, walks off the screen probably wondering what just happened. 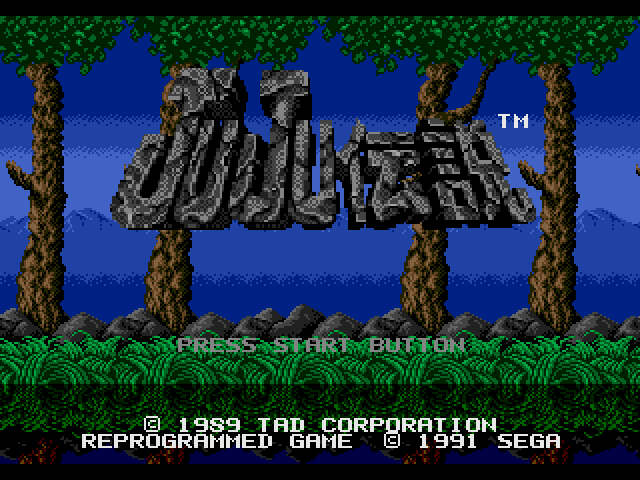 We are then treated to the game's title screen. The title music is chirpy and cheerful which seems kind of inappropriate given the tragedy that has just unfolded before our eyes. If there was an Ofcom for video games, I'd write a letter of outrage to them. The game's options are fairly standard, although it is possibly to give yourself a ridiculous number of lives (9 lives, 7 continues) and set it so you get a new life every 7000 points. Which is what I always do. So, onto the game. At first, things don't start off too badly. Toki moves responsively to your commands, and it isn't long until you come across power ups to upgrade his spit attack. These power-ups are varied and are also quite plentiful and seem to do quite a bit of damage. And it all starts off quite fun. However, it's also not long until you come across some initial frustrations, such as stupid spikey triangle rocks that keep appearing. It's impossible to jump over them, so you have to destroy them by firing at them. One or two wouldn't be an issue, but having them appearing regularly and for no real reason is just annoying. It's not as if getting rid of them requires any real skill other than being able to fire at them. All they do is stop your progress for a few seconds. This initial frustration then leads to other frustrations. 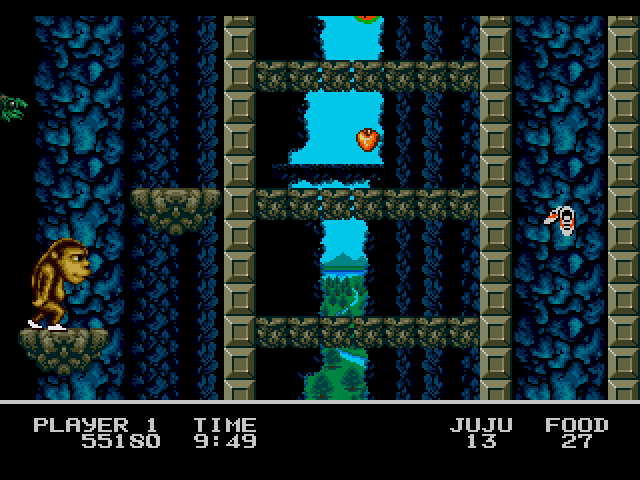 Toki doesn't seem to be in a rush to rescue his damsel in distress and plods slowly through the levels. He also can't jump very far, and gets killed every time something touches him. This wouldn't be too bad though if you had a fair chance of avoiding some enemies. Unfortunately, you don't. Sometimes, you only discover that something is waiting to kill you when you've already begun your jump into it. Enemy avoidance becomes something of a memory test rather than a test of skill. Most of the levels are standard platform stuff with little variation between them. There is the obligatory water level and ice level, but most of the rest are fairly similar. Water levels have always been a pet hate of mine, but fortunately they're piss-easy in this game and are done within a matter of minutes. The ice level though provides quite a challenge and is both fun and frustrating at the same time. You'll be glad you've done it when you've, er, done it. At the end of each level is an end of level boss. 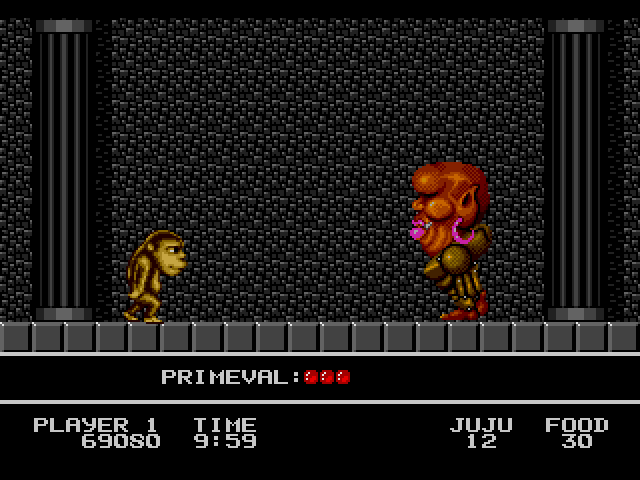 Most levels (possibly all) feature three rounds followed by an end of level baddie. Early ones are very easy to defeat. Towards the end of the game, they get quite difficult, and you'll find that you'll probably lose most of the 100s of lives you've built up on them. One of the other problems with the game is that it is quite samey. There isn't much to differentiate the style of one level from another, even despite there being water and ice ones. Graphics are dull and murky throughout. It's as if the graphic artist had a constant hangover and couldn't cope with any colour brighter than dark blue, dark grey, dark green or dark brown, and their varying shades of darkness. 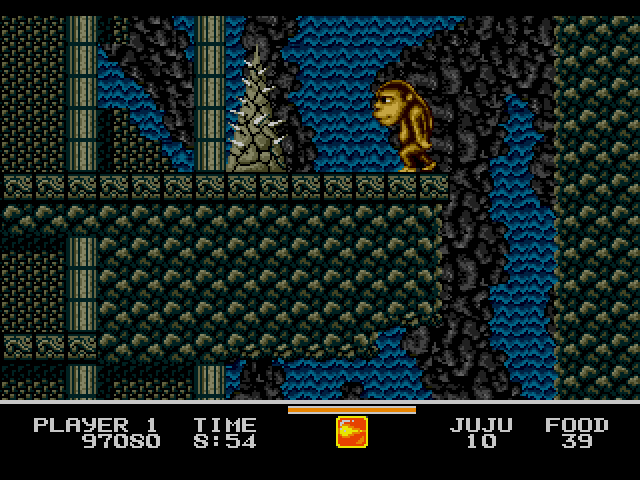 There is one level featuring bright fire lakes and suchlike which he probably did after having a sober day. That said, the graphics aren't horrible - they just aren't exciting, and as they don't differ much from one level to another, you don't real feel that you are really progressing through the game and getting any closer to its end. The music also causes this effect too, as the same tune plays for every level, apart from on the water level and for the end of level baddies. Toki: Going Ape Spit isn't a terrible game, nor is it a great game. The game is frustrating in parts but it isn't unplayable. It's not the most attractive of games, but it probably doesn't need to be. Does it improve on the arcade original? Nope. Playability-wise, I'd probably say it's on par with the original, but it's a different game that uses the arcade's characters and ideas. I would have thought that the reasoning behind re-doing the game was to iron out some of the faults of the arcade game. Unfortunately, this wasn't done. It was just that the same problems were replicated in a different game and, to be honest, I would have preferred an actual conversion of the arcade game on the Mega Drive as I'm sure the console would have been up to it. Level 2 features many unexpected pitfalls. Did you ever wonder what happened to that ugly kid out of Magic Pockets? The one the programmers called Kid? Well, it looks like he became a transvestite and appears as an end of level baddie in Toki. Take a look for yourself! Kid's new job. End of level boss in Toki. 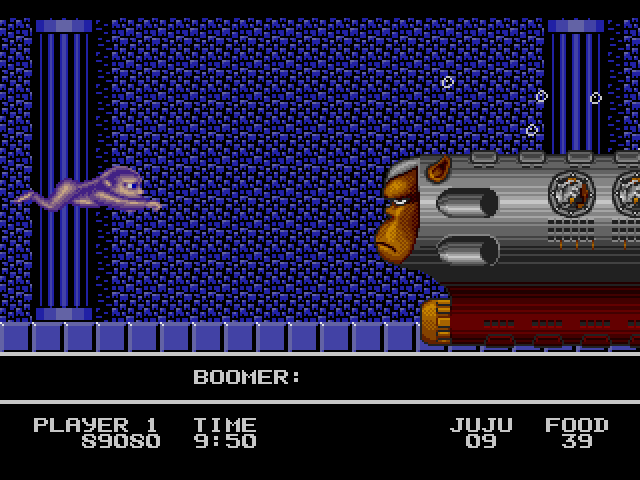 An opening sequence explains the story behind the game without dragging on, the title screen is ok, and presentation all-round is adequate but nothing extra-ordinary. Everything is well drawn and well animated, but it's all just so dull. With the exception of a couple of levels, the choice of colours is limited to 50 shades of drab. The game feels fun at first but quickly shows itself to be a dull plodding affair, full of cheap deaths and requiring a good memory rather than skill in parts. Toki is a very average platformer which is as dull to play as it looks. 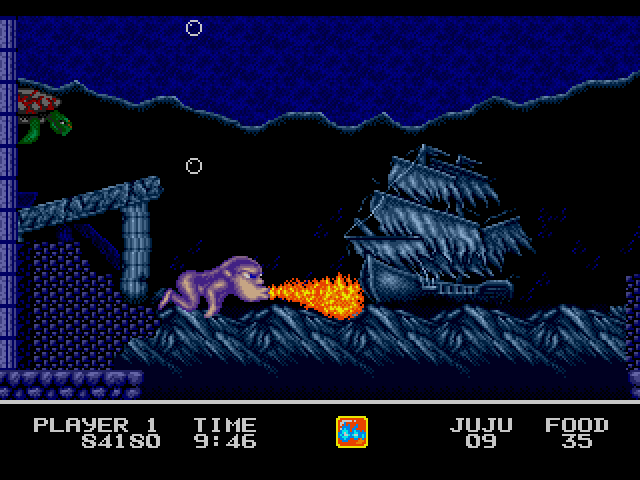 Although this version of Toki is a Mega Drive/Genesis exclusive, ports of the 1989 arcade original were released on Atari Lynx, Atari ST, Commodore 64, Commodore Amiga, iOS and Nintendo Entertainment System. A remake is scheduled for release on the Switch towards the end of 2018. A rerelease for iOS is still available, plus there's also a version available on Android although it's unclear if this is an official release. Once Toki rescued his girlfriend, he took better care of her and ensured she never got kidnapped again, so he didn't appear in any other games. See Mario, that's how it's done. Look after your princess! "Toki's easy to pick up and play, but the game is quite boring and has many frustrating elements and the absurd amount of lives and continues available make it a game you'll complete very quickly. The Megadrive has many quality platform games that make Toki look like the dull, unoriginal game it is." "Go ape-spit (shome mishtake shurely) with this decent enough platformer from Sega. It's quite nice to look at but nothing truly ball crunching and why is there no password save?" "The excellent platform action and frantic blasting is nicely broken up by the strange swimming levels and the whole thing hangs together extremely well. Certainly one of the better platform games available on the Megadrive." "Not a straight conversion, but a decent platform shooter nonetheless."